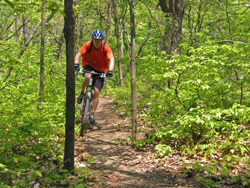 Pleasant Valley Park's 262 acres of woodlands, open fields, hilltops and remote valleys provide excellent areas for many outdoor activities year round. Anyone who enjoys being outdoors in a natural area, is likely to find something to like about Pleasant Valley Park. Pleasant Valley Park offers a wide variety of opportunities for hiking. A network of hiking trails have been developed, that allows for hikes of varying lengths and difficulty, by using combinations of trails through woods and existing old farm roads. The park is also crossed by some utility right-of-ways that can also be used for hiking, although they have some very steep areas since they don't follow terrain contours. 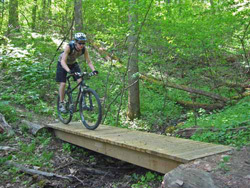 As of November 2011, the Pleasant Valley Park Volunteers have completed a little under five miles of trail. "Hank's Trail" begins just uphill from the parking lot. 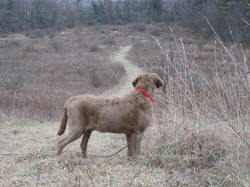 The hiking trails are mostly in the woods and follow terrain contours. There are also over two miles of old farm roads on the property, which pass beside or through meadows of various wildflowers and goldenrod. The farm roads offer opportunities for pleasant walking as they are wide enough for several people to walk side by side, have been mowed, and have only a few small steeper areas. 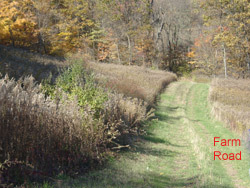 The farm roads are intersected by several of the trails and can be used to return to the parking lot. 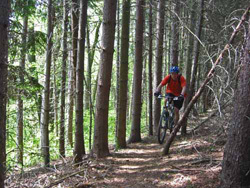 For more information about the trails and farm roads, see the trail map. Pleasant Valley Park is great for dog walking because of the size of the park. However, like in any other Municipal park, it is important for the dog's master to maintain control over the dog, to prevent disturbing wildlife or other park visitors. Also be aware that the park is used for controlled hunting during deer season. Dogs must be leashed or otherwise controlled (remaining in sight of the owner and must return promptly to the owner upon command). Dogs must be leashed in parking lots and around sports fields when in use. Dogs are prohibited in playground areas. Owners must clean up after their dogs. 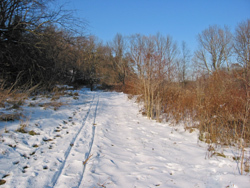 Some portions of the hiking trails are suitable for back-country type cross-country skiing and the opportunities will increase as additional trail segments are completed. 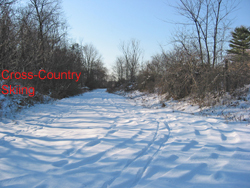 The old farm roads are fairly wide and much easier for cross-country skiing. 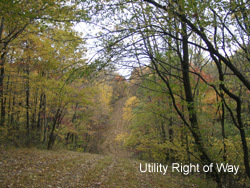 If you want something really challenging try a few of the steep areas on the utility right-of-ways; but watch out because there are likely to be rough areas, rocks, and other dangers. The hiking trails are also great for snow-shoeing. 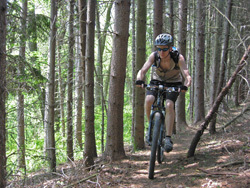 There are currently a little under 5 miles of trail suitable for mountain bike riding in Pleasant Valley Park. The park also has over two miles of old farm roads that can be used to extend your ride or vary the route.